In order to develop good virtues, we need to destroy the bad qualities in us. The quality of jealousy gets even into matters related to Divinity. Arjuna was seated in the chariot. 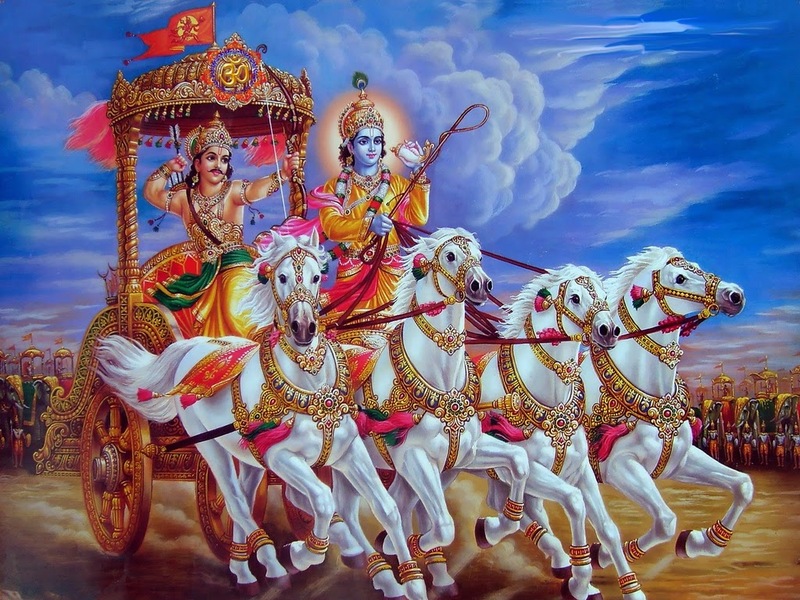 Krishna was driving the chariot. Though Arjuna had not understood Krishna’s aspect of Divinity completely, he had the faith that Krishna was a great person. Arjuna did listen to every matter explained by Krishna, but he did not “eat” it, in the sense, he did not make attempts to put them into practice. Here is a small example to illustrate this. War was going on. Deadly weapons were being used against Arjuna. That day, the war was being fought against Bheeshma. (Eventually) Bheeshma fell down. Many dangerous weapons entered into the chariot that day. Though Arjuna had faith in God, he entertained the feeling of pride and ego that it was he who had accomplished victory in the war. The sun set and they returned home along with their chariots. The feeling of pride that Krishna after all merely drove the chariot and it was he (Arjuna) who had actually acquired victory in the war, entered into Arjuna. As soon as the chariot reached their tent, Krishna said, “Arjuna, you get down and go inside”. The egoistic Arjuna felt, “I am the owner, Krishna is after all the driver. Therefore, the driver should get down first and only when he opens the door for me, I should get down. This is the right protocol”. Thinking so, Arjuna said, “Brother-in-law, you please get down first”. But Krishna replied, “No, no Arjuna, you get down first”. In this manner, the argument continued. In a sense, Arjuna was also partly jealous of Krishna. He thought, “I am in this situation, because I always regarded Him as someone great. But is He greater than me?” Well, the war had to still go on. If Arjuna were to develop enmity with Krishna now, he wondered what would happen the next day. Thus, sensing some fear, Arjuna got down. He stood near the chariot. Krishna again insisted, “You go inside (the house)”. Left with no choice, Arjuna went inside. Then, Krishna sprang and jumped out from the chariot. Instantly, the chariot got burned into ashes. Surprised at seeing this, Dharmaja and Arjuna enquired Krishna about the reason for this explosion. Krishna said, “Arjuna, no one has understood the principle of Divinity and the Divine play or sport. God has no selfishness. His only vow is to protect His devotees. His only duty is to nurture His devotees. Today, all the arrows shot by Bheeshma were pressed under the toe of my feet. That is why none of the weapons could harm you. If at all I had got down first, all these weapons would have exploded and turned the chariot into ashes. Under these circumstances, you too would have burned to ashes. Without recognizing this truth, you were insistent that I should get down first. Once Arjuna heard these words, he vanquished his ego. Finding faults in God is also a quality of jealousy. You may have heard this short story from the Mahabharata. 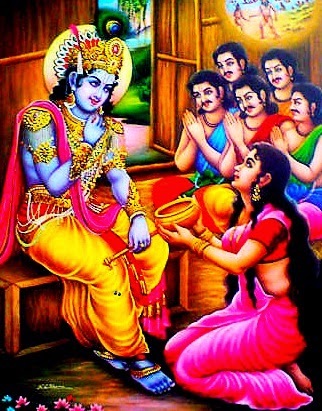 To gain ownership over Krishna (to make Him exclusively belong to her alone), the selfish Satyabhama went to Narada and prayed to him for some mantra (sacred formula as a combination of words), yantra (sacred diagrams or amulets) or tantra (sacred rituals) or any other appropriate advice. Narada decided to teach her a suitable lesson as he knew that such selfishness will never work with the Lord. He thought of teaching her a good lesson to make her realize her folly. He said, “Mother, you need to perform a vow called the Pativrata (a vow for the husband, also called Tulabharam. See note at the end). According to that vow, you need to first donate your husband to someone and then buy him back by giving equivalent wealth (equivalent in weight to the weight of your husband) to that person. If you purchase your husband back in this manner, he will be with you always, at all places, at all times, forever”. Satyabhama who had not understood the Divine principle, who had not recognized the Divine powers and capabilities; being subsumed by selfishness, felt that this is a very easy path and therefore accepted the proposal. Having agreed to it, she performed the vow. As part of the vow, she donated Krishna (her husband) to Narada himself. 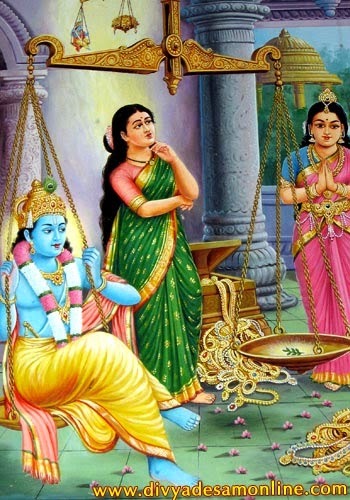 Having sold Krishna to Narada, to buy Him back from Narada, she started making efforts to weigh Krishna. On one pan (of the weighing balance) Krishna was made to sit down and on the other pan, she brought all her wealth and placed them there. But the pan carrying Krishna did not move a bit. Recognizing this situation, Narada saw an excellent opportunity. He exclaimed, “Mother Satyabhama, since you are not able to offer to me wealth equal to the weight of your husband, from tomorrow your husband will belong to me. So, I am taking Him now”. Worried about the situation, Satyabahama started wondering as to who would come to her rescue at this point. She thought about Rukmini and felt that maybe she would be able to help her. So, she went to Rukmini. At that time, Rukmini was standing there doing Tulasi Puja (worship to the plant Tulasi – holy basil). Looking at her state, Rukmini said, “Sister, you need not worry. I will come there immediately”. Saying so, she kept the Tulasi leaf in her hand, touched it to her eyes in respect and followed Satyabhama to Krishna. However, the situation there, between Krishna and Narada, could be understood by Rukmini as she had Chitta Shuddhi (pure mind). Recognizing the situation, she too smiled and said, “Oh! Satyabhama has made an attempt to buy God through wealth. Since this is a very wrong approach, she has become a victim of this plot”. She went forward and said, “Narada, only the name of Krishna can match the form of Krishna in weight”. Saying so, she called out “Krishna”. But Narada did not agree to this. He said, “I will not accept if you offer a formless name in return for the physical form of Krishna”. He stubbornly demanded a physical offering in return for the physical form. A leaf or a flower or a fruit or water; Krishna, if it is true that You submit Yourself to the one who has true devotion, then I believe you will weigh to this Tulasi leaf. Saying so, she bowed down to Krishna and uttering His name Krishna (with all devotion), she placed the Tulasi leaf in the pan. The name of Krishna exactly equalled in weight to His Form. The Tulasi leaf alone became extra and weighed in excess, in the balance. Therefore God will be accessible only to the mind that worships Him with Love. He will never be accessible to those who pretend to have understood Him through some knack or strategies and make an effort to get Him caught into their fold. To whatever extent you perform your tricks and knacks, God is determined to perform the same tricks and knacks a 1000 times more and turn you into a dog. Therefore, be pure minded and try to win God with Love. However, if you merely act superficially, overstep the command of the Lord and take to the wrong path, rest ensured that you will never be able to seek or get God. Note: Tulabharam is a ritual, symbolic of offering oneself to the Lord. Since one has to live in this world performing one’s mundane worldly affairs, till life lasts, one offers a representative item equal to his / her body weight; usually items like bananas, coconuts, jaggery, fruits, grains or if one can afford, even gold. The ritual consists of literally placing the individual who makes the offering in one pan of the scale and the item to be offered in the other pan, until the two pans of the scale balance equally). Anger if at all, is shown only to correct the devotee. God alone is transcendental and He transcends all qualities (attributes). Though it may appear to us that He is angry, it is not truly anger. God pretends to be angry in order to bring back the devotee onto the right path. The devotees will not pay heed if harsh words are not used. That is why He puts up the drama of being angry, to bring the devotees onto the right path. It is all only a drama and not reality. God has no anger. He does not give any scope for anger at all. When we commit mistakes, we think that God will get angry. But God pretends to be angry only to remind you of your mistakes. At certain times, when Bhagawan does not talk to you, you feel, “Oh, Swami must be angry with me, why is He not talking to me?” Swami has no anger at all. In all aspects, there is only the principle of Love. But even this Love, when expressed with harsh words appears as anger. In our day to day life, we find that we commit so many mistakes. “Son, come here”, if called that way (in a very soft and loving tone), it will appear as Love. “Son, come here” (said very sternly), will appear as anger. This is only a modulation of voice (change in tone) and nothing else. This is what Durvasa came to be known for. Durvasa had no anger as such. But people in the world think that Durvasa was a person full of anger. Aswathamma took an oath (to kill the Pandavas). Pandavas were not to be seen anywhere. Now Krishna had to rescue them. He had to put up so many acts. The actions of God are all mysterious. For every situation He has to act. The scene has to be changed each time. The drama has to be enacted each time. Krishna ran to sage Durvasa. Durvasa bowed to Krishna and received Him with great respect. He asked, “Swami what brought You here to my Ashram?” Krishna said, “I have a simple task. I have come here to get it executed through you”. Durvasa said, “I am duty bound by your command. I am ready to do anything”. “In that case”, Krishna said, “You have to save the Pandavas tonight”. Durvasa replied, “It is only You who can protect. How can I protect anyone?” Krishna replied, “My doing is different. Getting the work done through you is different. My protection can be in various forms. You have to carry out one task”. “What is it that I have to do?” asked Durvasa. Krishna said, “Dig a pit. Make the Pandavas sit inside that pit. Then cover the pit with a plank. Place your seat over the plank and sit on it. In the meantime, Duryodhana or Dushashana or some others will come by. Possibly, the son of Dronacharya (Aswathamma) may come. They will come and ask you – O Swami you are omniscient. Please tell us where the Pandavas are.” Durvasa immediately responded, “Swami, I cannot tell a lie”. Krishna replied, “O foolish ascetic, did I ask you to tell a lie? I will never ask you to tell a lie. Satyanaasti Paro Dharma (There is no Dharma greater than Truth). Truth is My Dharma. Tell the truth. But change your tone (modulate your voice)”. Aswathamma came and very humbly asked (Durvasa), “Swami, where are the Pandavas?” Durvasa shouted with fury, “Pandavas are below me!” He just changed his tone. The moment he heard this voice (of Durvasa), Aswathamma ran away from there. Thus, the life of the Pandavas was saved. Similarly, it becomes necessary for Me also at times to change My voice. By modulating the voice, certain tasks are accomplished. In all Avataars, this practice (of voice modulation) has been going on in a natural manner. Sages, saints and aspirants; just by changing the tone of their voice have been bringing about protection or punishment. Sage Durvasa also brought about protection and punishment by modulating his voice. Many ignorant people criticize Durvasa, stating that how can such a great saint have anger in him. But only those who understand the inner significance of anger will enquire into this truth. God has no anger of any kind. The one who gets angry can never be God. But, He changes His voice to protect people. No sage or saint can have any anger in them. One day there was a great calamity. Krishna was being glorified in many ways, even in the Devaloka, i.e. land of the Gods. (The demon) Aghasura was dead, Putana was also dead, Shakatasura was also dead, and in this manner many demons were killed (by Krishna). The Gods too rejoiced and observed, “Wow! This embodiment of Narayana is performing such good work on the planet earth. He is killing all these demons”. This news reached the ears of Brahma. He thought, “What? Such a small child and he is accomplishing such mighty tasks”. Thinking so, he attempted to test Krishna. That night, Krishna gave some sound advice to all the boys (cowherds). “Today, let us not take the cows (for grazing). Instead, let us take the calves. Along with the calves, bring with you whatever musical instruments you know to play and come to the forest. Today we will spend our time in the forest with music, by playing these musical instruments”. Most of the Gopalas (cowherds) knew how to play the flute. They held the stick (to guide the calves) in one hand and the flute in the other hand. Only two boys brought pots with them. What is the music that can be played using these pots? They keep the pots against the stomach and beat on it to the rhythm. Today, in music, this instrument is called the Ghattam. This began in the Dwapara Yuga itself. They went to the forest with the calves and sat near the banks of the river Yamuna. 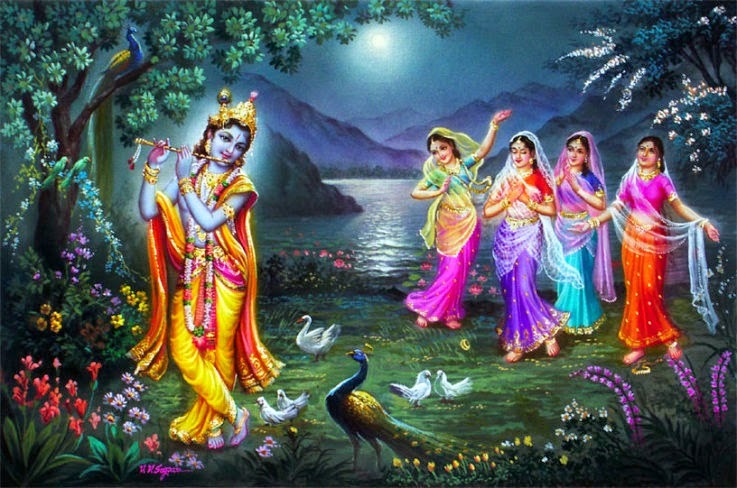 Boys were playing the flute, some were playing the Ghattam and Krishna was dancing. 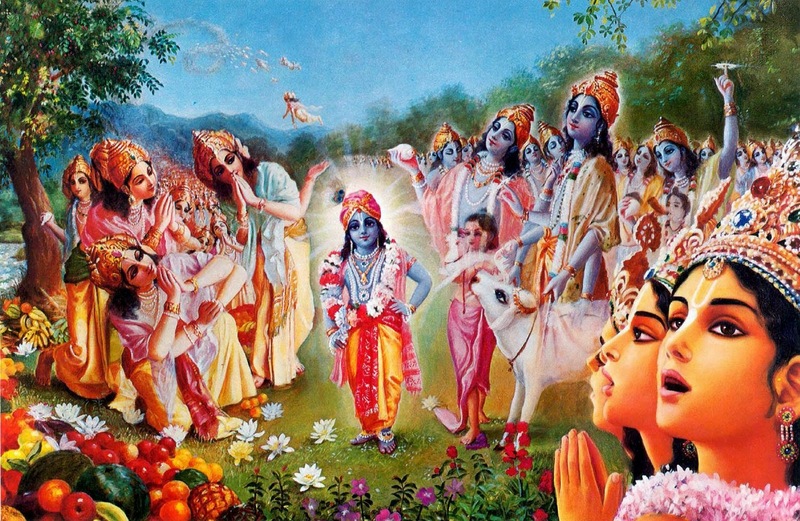 Once Krishna stopped, others would start dancing. In this way they continued playing. At a distance, they observed a huge palm tree. The tree was filled with palm fruits. Two friends of Krishna were very close to Him and were very important for Him. One was Damudu and the other was Subala. These two were always on the right and left of Krishna. Slowly, Damudu went near Krishna and softly pinched His thigh. He said, “Krishna, I am hungry. See, on that palm tree; there are as many fruits as we need. We want those fruits. Balarama (Krishna’s brother) who was just by the side said, “Wait, I will go and fetch them”. Balarama went running and moved each of the trees. All the fruits fell down. Because of the mighty strength of Balarama, all the trees became fruitless. Who is the one, who named Balarama? It was Garga. What did Garga say? He said, “This child is very strong. His glow is very attractive. Since he is attractive and strong, you may keep his name as Balarama”. Balarama thus shook the trees. At that time, a big donkey (a demon) appeared there. Balarama held its two legs and beat it to the ground. The heart stopped and the donkey died. All the boys held Balarama, jumped and played, and experienced happiness. Observing this moment, Brahma created a big cave there. As these boys were drowned in music and enjoying, Brahma led all the calves to enter into the cave. The boys then went in search of the calves, crying out, “Krishna, Krishna, where are the calves?” Krishna knew the truth. However, He said, “Please go and search for them there. Go near that cave and search for them; they are in there”. The cowherds looked all around and entered the cave. Once they went into the cave, the cave got closed. The boys and the calves were both locked inside the cave. Not for just one day or two days or for three days; they were locked inside the cave for one full year. What did Krishna do then? He thought, He should teach a lesson to Brahma. He transformed Himself into each of the calves. That is, He Himself took the form of each of the calves. 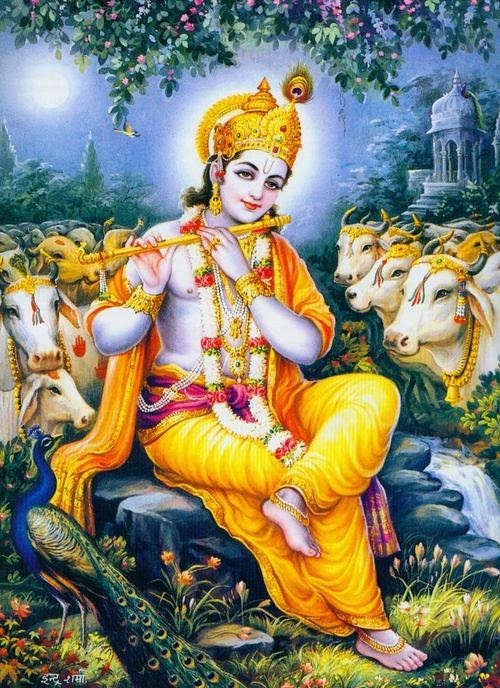 As many the number of calves, that many forms were assumed by Krishna. As many cowherds were there, that many forms were assumed by Him. As the evening approached, Krishna and Balarama took the calves and went home. Brahma prayed to Krishna and asked for forgiveness. Krishna sent all the calves and cowherds in the cave, back to their home and He assumed His true form. Thus, God can assume many forms. He can assume the forms of all the existing beings. That is why, it is said, “Isavaasyam Idam Jagath”. The entire world is verily the form of God. All forms are verily the Form of God. How is this possible? How can God assume so many forms? Mano Moolam Idam Jagath, the mind is the basis for all creation. When God Wills in the mind, any change can happen. (Consider this...)Last night, you have gone to sleep. Your body is on the bed and you are experiencing a dream. In your dream, you are seeing so many people, so many things, so many houses, so many individuals. You are seeing yourself also. Who created all this? All the forms in the dream are imaginations / reflections of the mind itself. The body is lying on the bed. Ekoham Bahusyaam. Being One, He assumed many Forms. It is impossible for everyone to understand this Divine Principle. Considering the human form (assumed by God) as an ordinary human being, all are drowned in Maya or illusion. They think, “That body is also like my body only. That body also eats like me, that body also moves around like me. Therefore, there is no difference between the two bodies. I am not different from Him”. Thus they see oneness here. But they do not see oneness of the Atman (Self). They are seeing only the physical form. Thus it is very difficult to recognize the Divinity when it assumes a human form. During the exile of the Pandavas, sage Durvasa once entered the forest with many of his disciples. He came with the intention of humiliating the Pandavas. However great a sage he may be, none can cause any harm to the embodiments of Dharma (righteousness). Dharmaja came to Draupadi and said, “Draupadi, sage Durvasa has come with thousands of his disciples. We have to offer food to them. What should we do? Being the one who fed lakhs of people, today I am in a position where I cannot give alms to even a few people”. Dharmaja was very worried. Draupadi replied, “Lord. We do need to have any worry. We have with us, the Aapadbhandava (saviour), the Anaatharakshaka (protector of the forlorn). We have God with us who will protect us at the right time. Then why should we worry?” She prayed to Krishna, “Krishna, at this time, we have none other than You. You alone have to protect us. To add further, Durvasa is very short tempered. My husbands should not become a victim to his anger. It is OK if I become a victim”. Just see, Draupadi sacrificed her self-interest. “Even if I become a victim, it is OK, but nothing should happen to my husbands”, she thus prayed to Krishna to protect her husbands. Krishna appeared then and there on the spot. He started speaking to Draupadi as though he had started on his journey long back. He said, “Since the time you all have come to the forest, I have been desirous of seeing you”. He started talking like an ordinary human being. Can He not be just happy to see them? No, He started playing a drama there too! He said, “Draupadi, I am feeling very hungry”. Draupadi lamented, “We are unable to offer food to Durvasa himself. How can we offer food to You? To You, in whose stomach, the entire cosmos is present, can we ever offer any food? You too have come here like a great man asking for food. Where can I get food from? We are in the forest. We are spending our time eating roots and tubers. Krishna, You only tell me. If there is anything, anywhere, I will surely give You. I am ready to give You my very life”. Krishna said, “Draupadi, if you have the vessel in which you cooked the morning food, please get it here. Is there any leftover cooked food in it?” Whatever work Draupadi did, she did it perfectly. If she washed clothes, she would wash it perfectly clean. If she washed the vessels, she would wash them too perfectly clean. Even the house would always be clean like a mirror. Everything would be clean. She said, “Krishna, do You not know? I have washed the vessel fully clean. I did not leave any food particles in it”. Krishna said, “You just get it”. Therefore, Draupadi obeyed Krishna’s command. Her nature was to always act according to what was told. Krishna saw the vessel from all sides. There was some small particle of food sticking at the rear end, near the neck of the vessel. She had cooked green leaves that day. There was a small leaf sticking to the bottom. Krishna said, “Serve Me that”. Draupadi removed that particle and offered it to Krishna praying, “Krishna...”. Krishna declared, “Akshayam (let it be infinite)”. With that, Krishna’s stomach was full. When God is satisfied, the whole world becomes satisfied. When God denies you, nobody will accept you. When God says “Yes”, everybody will say “Yes”. Krishna was satisfied. With this, the stomachs of all the disciples of Durvasa were also filled. Having gone for a bath, they went away from there itself and never came to visit the Pandavas. Thus, Draupadi had this quality of great devotion. Having faced all trials and tribulations successfully, God Himself was impressed with her name and fame. Arjuna heard about the death of his son Abhimanyu. He collapsed the moment he heard the news about his death. Earlier, Arjuna was feeling sad since everyday as he returned (from the war), his son would come and receive him, but today he was not there to welcome him. What had happened to him? Krishna was just beside him. Krishna knew very well about Abhimanyu’s death. But it would not be appropriate to convey the news then. It is necessary to wait for the right time and circumstances and then convey the news (about the death). Krishna said, he (your son) will come, he will come... and thus brought Arjuna home. When Arjuna later learned that Abhimanyu was dead and it was Krishna who had allowed him to go to the battlefield, he shouted at Krishna, “You are a Vamshanaashi (destroyer of our clan)”. Arjuna accused Krishna, “Krishna, you have destroyed our clan, our lineage. The Pandavas have now aged. Draupadi too is old. Subhadra is also old. None are eligible to bear children anymore. Therefore, our lineage is gone”. Listening to all this Krishna smiled. He said, “(Arjuna) you are grief stricken and therefore you are speaking as you like”. Time passed. Later, Abhimanyu begot a son. But, it was still born (born dead). Draupadi brought that baby to show it to Krishna. She lamented, “Even this new born baby has been born dead”. She sent Sahadeva to call Krishna. Sahadeva brought Krishna to her. Draupadi took the still born baby in a plate. She cried out, “Brother, is this what You are gifting us, a dead baby?” Krishna smiled as He always does. Be it sorrow or difficulties or joy, He always smiles. He said, “See sister, his (the baby’s) eyes are just like those of Abhimanyu. His face too is just like that of Abhimanyu”. Arjuna got up and cried out, “Yes, his breath is also like that of Abhimanyu”. The meaning being, there was no breath at all. 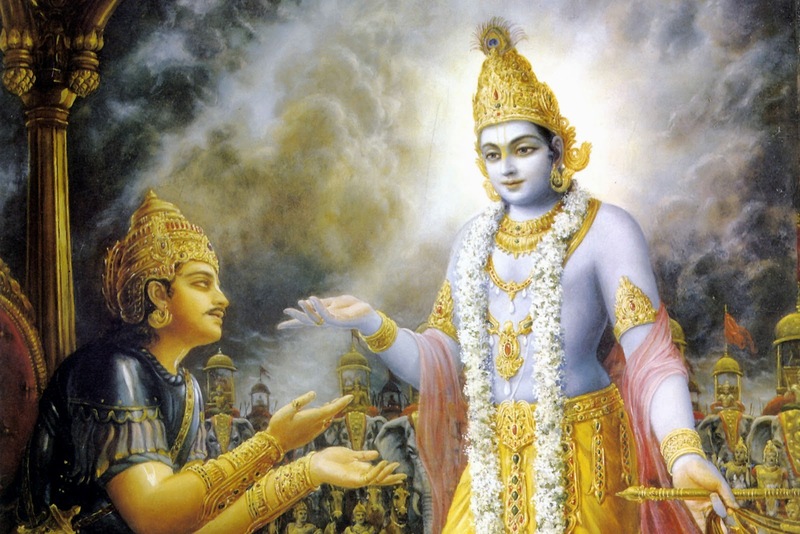 Krishna responded, “Arjuna, you are foolish. You are still not making an attempt to understand My (Divine) Principle. OK, fine, go ahead”. Saying so, Krishna and Draupadi sat down and started conversing. Draupadi had the faith that Krishna can do anything. Women always have greater devotion and sincerity. It is typically the wives who drag and bring their husbands (to Swami /to God). God has given devotion (Bhakti) specifically to women. Men have been bestowed with wisdom (Jnaana). That is why women can enter even the inner rooms (Antahpuram) of a king’s palace, but men cannot enter into these inner rooms. Men can go only until the Durbar hall (this was the practice in earlier years, in the palaces of the kings). Similarly, women devotees are free to go anywhere (in God’s kingdom), but men cannot. There are boundaries for men. Why? Because, devotion is less in men and more in women! Draupadi had full faith in Krishna. She was convinced that Krishna can surely grant life to the dead baby. Bheema, Arjuna, Nakula, Sahadeva and Dharmaja all sat with their heads bent down (in sorrow). However, Krishna kept on conversing with Draupadi. The others could not understand anything that Krishna was speaking. Arjuna was getting more furious. But, he could not say anything. Then Krishna said, “Sister, bring the baby to Me”. He placed the baby in the plate and tapped it hardly. The baby cried out! The moment the baby cried out, all the others lifted their head. They saw the baby. Krishna said that since this baby was examined (pariksha) by Him, he should be named Parikshit. Arjuna went and held the feet of Krishna. He cried out, “Krishna, you are Vamshodharakka (the emancipator / promoter of our clan)”. Krishna replied, “Arjuna, few days back, you called Me Vamshanaashi (destroyer of the clan). Now you are calling Me Vamshodharakka (the emancipator / promoter of the clan). Both are related to your mouth and word. But for Sai, it is always Yes, Yes, Yes. You say that and you say this also. You say Vamshanaashi and now you say Vamshodharakka. All this does not affect Me! Gopikas alone are My true devotees!! Today, in the name of love, you are playing the game of musical chair. You are not allowing the chair to belong to one person. At one time, one person is given the seat, at another time, some other person is given the seat. How can you say the chair is yours then? The Gopikas alone demonstrated that type of authority as an ideal. They lived with all Divine feelings. They experienced every sensory organ with the feeling of making it an offering to God. Their talk was all about God, their thoughts were all about God, their hearing was all about God, their hands were always engaged in the work of God; thus they used all their sense organs with the feeling of offering the experience to God. One could not see anything that they considered as their own. Who are they after all? It is Krishna who is theirs! Here is a small example. Krishna set their (Gopikas’) devotion as a witness and as an ideal for all. I have told you this many times. One day, all of a sudden, Krishna pretended as though He had heaviness and pain in the head. He desired to have some medicine for the headache. The omniscient Krishna always demonstrated His Leela (Glory) in the right situation when all were present. Satyabhama, Rukmini, Narada, Jambavati, all were present close by. Krishna was not accepting even a morsel of food. He played a big drama. He said, “I cannot tolerate this pain”. Narada who witnessed this scene, exclaimed, “Swami, where can we get the medicine for this? Please tell us and we will certainly get it”. Krishna replied, “If you go to Repalle, get the dust from the feet of the Gopikas and place the same on My forehead, then this headache will reduce. The Gopikas are great devotees. The dust from the feet of those great devotees alone will reduce My headache”. Listening to this, the pride hidden inside Narada surfaced. He said, “Swami, Satatam Yoginah, I am continuously in Yoga (union) with Krishna. 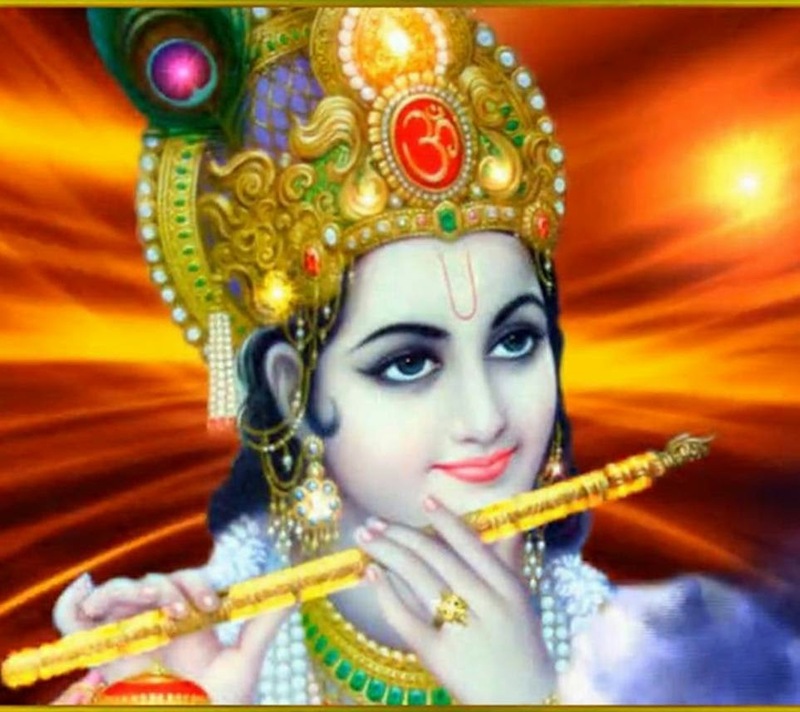 Sarvada, Sarvakaaleshu Sarvatraa Krishna Chintanam – I think about Krishna incessantly, at all times and at all places. Wherever I go, I contemplate on Krishna. Can there be a greater devotee than me in this world?” But Krishna did not agree to this. He said, “Narada, you may be a devotee, but it is only the dust of the feet of the Gopikas that will reduce My headache”. Narada was a wise one. He started showing his intelligence in his words. The ones who are excessively clever, usually talk excessively too. These clever, intelligent people are full of doubts always. The more one thinks that he possesses the strength of intelligence, the more negative strengths too he will have. Narada said, “Krishna, fine, my devotion may not be that great. But what about Satyabhama? She has offered her entire life to you. Can you not don the dust from her feet?” Satyabhama spoke out, “Narada, I am Sati, the consort of Krishna. It is such a sin to place the dust of the feet of the wife on the head of the husband. I will not agree to this. If I do this, it would be like jumping into the well of sins”. Here too, there was complete selfishness. The selfish feeling arose in her that by placing the dust of her feet on the head of her husband, she would drown in the lake of sins. Therefore, Satyabahama did not agree to give the dust of her feet. Rukmini also entertained similar feelings. None of them came forward to give the dust of their feet. Second by second, Krishna’s headache was increasing. Having no other way out, Narada arrived at Repalle. The moment Narada arrived there, all the Gopikas surrounded him. They cried out, “Narada, how is our Krishna? When is our Krishna coming to Repalle? Please let us know”. Narada replied, “Mother, I do not know anything about Krishna coming here. But, right now, He is experiencing very severe headache. I have come here for the purpose of getting medicine that would relieve his headache”. The Gopikas exclaimed, “Narada, is the medicine that will relieve the headache of our Krishna available in Repalle? If you tell us where the medicine is available, we will surely fetch it without fail”. Narada replied, “Mother, the dust of your feet is the medicine that will be able to relieve Krishna of His headache”. One of the Gopikas went in. She returned with a sheet. All of them dusted their feet onto it and tied it into a bundle. Narada took it and journeyed back to Krishna. This is an example of their selflessness. They never entertained thoughts like, “We are devotees, His servants. How can we give the dust of our feet to Him?” They felt, “If Krishna is happy, that alone is enough for us. We are not deserving or eligible for any arguments. Our life itself is an offering to Him. His joy is our joy.” When they gave the dust of their feet with such Ekaatma Bhaava (feeling of oneness), the headache of Krishna got cured. By the time Narada reached there with the dust of the feet of the Gopikas, Krishna was smiling and speaking to all. Krishna said, “Narada, you all are very egoistic, thinking that you are great devotees. You are leading your life with such ostentation. Out of selfishness, you think you are offering your life to Me. Egolessness, selflessness, absence of ostentation, are to be found only in the Gopikas and not in any one of you”. Today in the world, everybody claims that they are Swami’s devotees and that they are close to Swami. They feel so, but truly none of them are. In every devotee, there is some amount of selfishness. So long as there is selfishness and pride, God’s vision will never fall on them. How does this happen? The sun is always shining. When dark and dense clouds obstruct the sun, none can see the sun. But is there no light? It is there. But since the clouds obstruct the sun, that light is not able to fall on you. In the same way, God is always the form of Love. But since ego, selfishness and ostentation come as an obstruction in the form of dark and dense clouds; He is not able to spread the principle of Love on you. Lord Krishna told Arjuna, “Arjuna, you must be wondering how you can contemplate on Me during the war. Think of Me and you will gain victory in the war for sure. Maam anusmara yuddhyacha..
Arjuna, you should always think of Me and at the same time carry out your prescribed duty of fighting. With your activities dedicated to Me and your mind and intelligence fixed on Me, you will attain Me without doubt. Even in the war, think of Me. I will take care of everything. However, it is essential to have faith in these words. Here is a small example to illustrate the same. I have told My students several times. The Mahabharata war commenced on the New moon day (Amavasya). The previous day (Chaturdasi), when it was time to make all arrangements for the war, Arjuna stood still, feeling very dejected. Earlier the same Arjuna had compelled Krishna in all ways. He had said, “Krishna, do not go as the ambassador to negotiate with the Kauravas. Let us get determined to wage the war”. Such a person, when the war was to commence the next day, stood there totally dejected. In order to remove his worries and infuse in him courage and inspiration, he had to be taught the Gita, the teaching of wisdom. But in order to teach him the Gita, he needed to have total faith on Krishna. Therefore, first Arjuna had to be tested. Krishna was taking Arjuna through the forest. It was getting dark. They turned around to return home. In order to divert the mind of Arjuna (from the war related anxiety) Krishna started a conversation, “Arjuna, see that peacock over there. It is so beautiful!” Arjuna replied, “Yes Swami, this peacock is very beautiful”. Krishna said, “Oh madcap, that is not a peacock, it is a big eagle”. Arjuna promptly responded, “Yes, Swami, it is an eagle”. Krishna patted him on the back and said, “Oh foolish one, you are not making any enquiry to know whether it is a peacock or an eagle. See, it is neither a peacock nor an eagle. It is a pigeon!” Arjuna again responded, “Yes, Swami, it is a pigeon”. Krishna admonished Arjuna, “Don’t you have any intellect? Do you have no discrimination power? Your thoughts are lost somewhere. You are not enquiring at all whether it is a peacock or an eagle or a pigeon”. Krishna was overjoyed that Arjuna had such faith in His words. Krishna embraced him tightly and said, “Now, you are My devotee. Come, let’s go”. After ensuring that Arjuna had such faith in Him and His words; Krishna started teaching him the Gita. What would be the use of teaching the Gita to one who has no faith? Therefore, first and foremost, we must have total faith in the Vedanta (wisdom of the Vedas). Only when there is strong faith, one can conduct accordingly. Whoever it may be, if they follow Swamis command with total faith and with incessant thoughts on Him, they will get Sakshaatkaara (realization of Swami) within one second; just one second, one second, one second!! For the sake of devotees, Lord Krishna will undertake any task, however menial it may be. Yesterday I told you that in the 11th year (of the exile of the Pandavas), in the Roma Rishi forest (where sage Roma Rishi – the sage with very long hairs, was practising penance), Draupadi and Dharmaja (Yudhistira) were walking by. Draupadi saw a ripe fruit on a tree. She said, “Lord, this fruit can serve as food for all of us today.” As she said so, Arjuna appeared there searching for them. Arjuna struck the fruit with his arrow. The fruit fell down. Once it fell down, Arjuna tried to pick up the fruit. But he could not. Next Dharmaja also tried to pick up the fruit, but in vain. Later, Draupadi and the two of them together tried to pick up the fruit, but failed to even move it. Dharmaja exclaimed, “O Lord Krishna, even a blade of grass cannot move without your Will.” As they were caught up in this situation, Bheema, Nakula and Sahadeva also came over there. They were very happy to see Bheema come over there. Bheema is the one with Bhuja balamu (physical power), Buddhi balamu (intellectual power) and Gadha balamu (power of the maze). He attempted to lift the fruit with his left hand but could not even move it. He then used both his hands, but it was not enough. Even the five Pandavas and Daupadi – the six of them put together, were not able to lift the fruit. Why do we chant Shanti three times? Adibhautika, Adidaivika and Adhyatmika – we need to acquire peace at all three levels – body (physical level), mind (mental level) and Atma/soul (spiritual level). Lord Krishna told Roma Rishi, “May you attain peace.” Later Roma Rishi enquired, “Krishna, what are your strange, mysterious ways? There are none greater than You. Is it not? Then, what is the inner meaning in You prostrating to these Pandavas?” Krishna replied, “Roma Rishi, I am Bhakta Manasa Sancharini, dweller of the minds of the devotees. I am Bhaktaparadeena – I submit Myself to My devotees. These are My great devotees. They are the ones who never forget Me under any circumstances. I have become a slave to such devotees. I am Paradeena, Paradeena, Paradeena I am under the control of My devotees.” Then Roma Rishi recognized the strength and capabilities of the Pandavas. He offered the fruit to them asking them to eat it and live a long life. He blessed them with long life, healthy life, happy life, peaceful life!! That is why till the end, Pandavas led a happy life, healthy life and peaceful life. Till when? Until they entered the heavens, they remained healthy. That is the significance of this Amrita Phalam (immortal fruit). They (Pandavas) became the recipients of Krishna’s Grace and also the grace of the Rishi. Therefore, if just devotion to God remains steady in us, we can achieve anything. God Himself will come to us as our servant. The (Mahabharata) battle was going on. On the 9th day, Bheeshma took a vow, “Before tomorrow evening, I will kill all the Pandavas”. Hearing this, Draupadi felt very sad. She prayed, “O Krishna, how will you save my husbands now? Please bless me to be a Deerga Sumangali (a long life as a married woman).” Krishna replied, “Let me see”. Once Krishna says He will see, He will definitely take care. That evening, all of them were exhausted in the battle. Bheeshma fell on the ground. By then, it was night and therefore all retired to rest. Krishna told Draupadi, “Draupadi, this is a very good time. Because of lack of sleep, Bheeshma is moving to and fro in his tent. He is repenting, “Oh, why did I curse the Pandavas, who are embodiments of Dharma (righteousness), in this manner? I took a vow to kill them. How can I kill these embodiments of Dharma?” Repenting thus, he was walking to and fro. It was 10.00 pm at night. In those days, by 10.00 pm all would be fast asleep. But Bheeshma had no sleep. Krishna told Draupadi, “Draupadi, now you go to Bheeshma and fall immediately at his feet”. The queens of those days used to wear sandals that made noise like “Kirr..kirr.kirr”. Draupadi being a queen; she too had sandals that made kirr.kirr.. noise. She was wearing those sandals and walking. Krishna stopped her midway. “If Bheeshma hears this sound, he will come to know that a lady (Draupadi) is coming. He should not know that. Remove these sandals.” The moment she removed her sandals, Krishna collected them in his Angavastram (upper garment) and tied it into a bundle. Keeping it under his shoulder, He told Draupadi, “you go first”. Draupadi went first. Bheeshama, lost in thought, was moving hither and thither. Draupadi went and instantly fell at his feet. As she fell at his feet, her bangles rubbed against each other and made some jingling sound. Thinking that some woman had come, lost in his thought, he blessed her thus “Deerga Sumangali Bhava” (may you live long as a married woman). Draupadi got up telling herself, “This blessing is enough for me”. As she got up, Bheeshma looked at her. “What Draupadi? Is it you? Why have you come at this hour? Who brought you here? Who taught you this knackful act?” Draupadi replied, “Grandfather, who else will teach me knackful acts? You are my grandfather (and you know). There is only one who teaches me knackful acts. He is none other than Krishna. It is Krishna who brought me here.” Thus, Draupadi narrated all that happened. 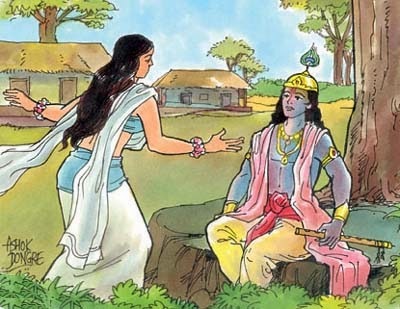 As Draupadi was narrating all that happened, to Bheeshma, Krishna entered the scene. On one hand, Bheeshma was rejoicing, “It is good that the Pandavas are now protected. After all, they are embodiments of Dharma. They are ideal sons of the land, great devotees. What more do I need than protecting such devotees?” Bheeshma, the great wise one, thought so. To protect devotees, God will engage in any task, however menial it may be. God has no differences such as low or high. He can do anything that needs to be done at any time. Protecting the devotee is His main aim.